You guys know my love for old doors runs deep. There’s just something so simple and beautiful about an old, chippy door. Whenever I see one it’s like a magnetic pull I can’t resist. Is that strange? Probably. 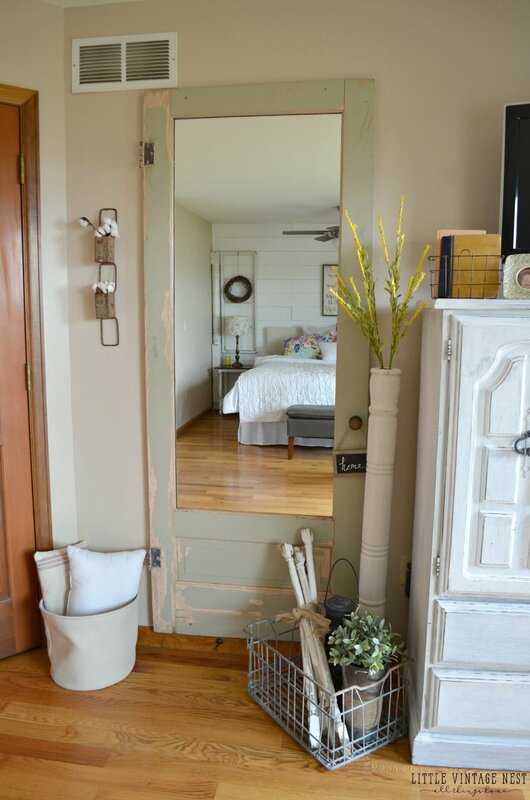 Anyway, for a long time now I’ve dreamt of turning an old door into a full length mirror. I’m happy to say it finally happened and now I get to share this little project with you all! It was actually pretty simple and didn’t take much time at all. 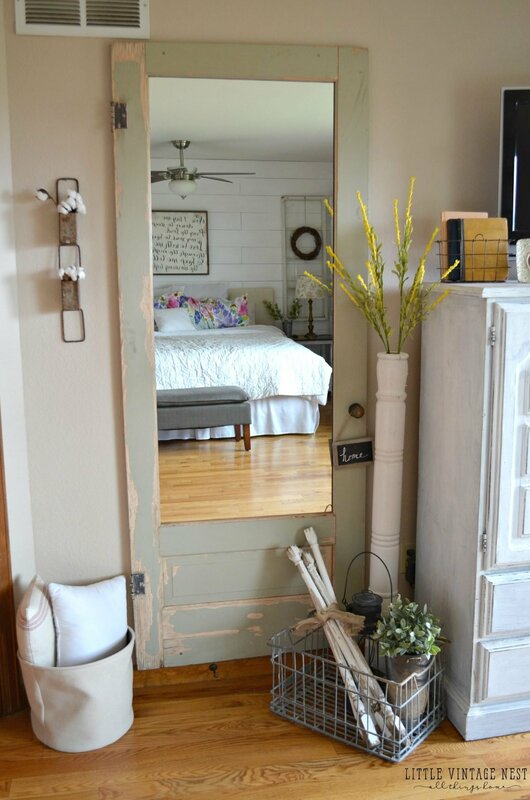 So if you’ve ever wondered how to turn an old door into a mirror this post is for you! Here’s the door before. This one worked perfectly for this project because of the large opening. 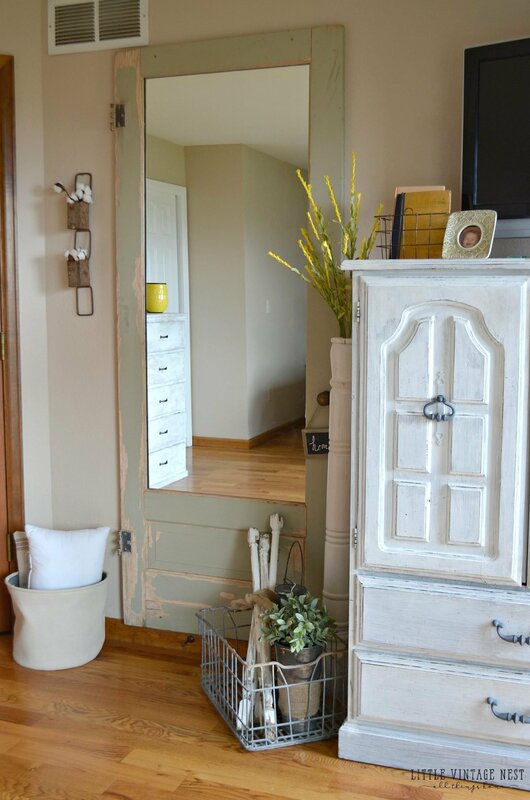 I wanted the mirror to be BIG, so this door was a great fit. You can call your local glass company and tell them you need a mirror cut to size, just give them the measurements. My dad actually put the mirror in for me. He’s sweet like that. He simply cut the mirror to size and added a protective cover on the back of the mirror. Then put it in place and secured it with a little molding around the edges. It’s nice and tight and ready to go up! Ta-da! Ain’t she a beauty? I’m soooo happy with how this turned out. I really wanted the mirror to be full length and this door worked perfectly for that. I love the size. I didn’t want it leaning up against the wall, like most of my other doors are, just because this is pretty darn heavy. Plus I have little people running around that spend a lot of time in this room. So we simply found the studs on the wall and screwed it in several places. This baby isn’t going moving. I have several old doors in our home and this is the first one I’ve had that isn’t white. Crazy, I know. I actually love the minty-blue color. And that rusty old door knob makes my heart happy. I styled this up with a few of my vintage goodies. I found that old milk crate while out junkin’ one day–I literally pulled it out of a pile of scrap metal. And those spindles are from the porch railing loot I talked about in my last post. I ended up getting about 3 bundles of spindles out of those railings! That old porch post was also in that haul. I just cut it in half and it works perfectly as a large vase for a few flowers and greenery. Let me know what you think of this little project. And thanks so much for stopping by, I really appreciate it! AWESOME!! I wish I had handy folks to help me create such beautiful things! Great Job. Love love love this project, Sarah! 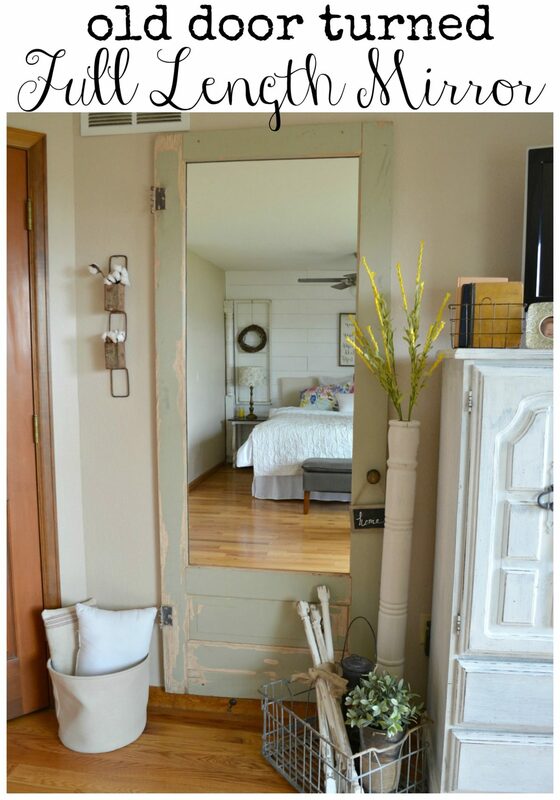 What an awesome way to use a beautiful old door! Hi Sarah! Just came across your blog today for the first time***thanks to MrsLMB***i am totally diggin your taste! Love your home and this beautiful door. Keep up the good work. 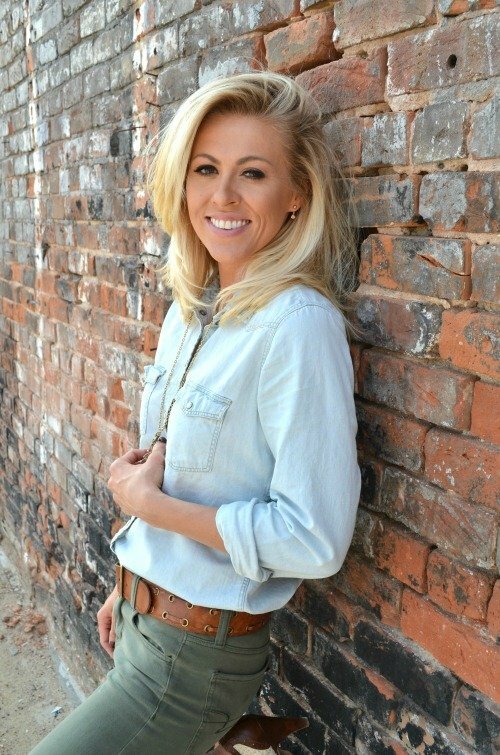 Looking forward to reading more of your blog! Aww thanks Lindsey, I’m so glad you came by! And thanks for taking the time to leave such a sweet comment, I appreciate it! This is perfection!! I love the minty color!!!! i love doors too, sarah, and have three in my house but the dearest of them to me is the screen door from the house i grew up in. 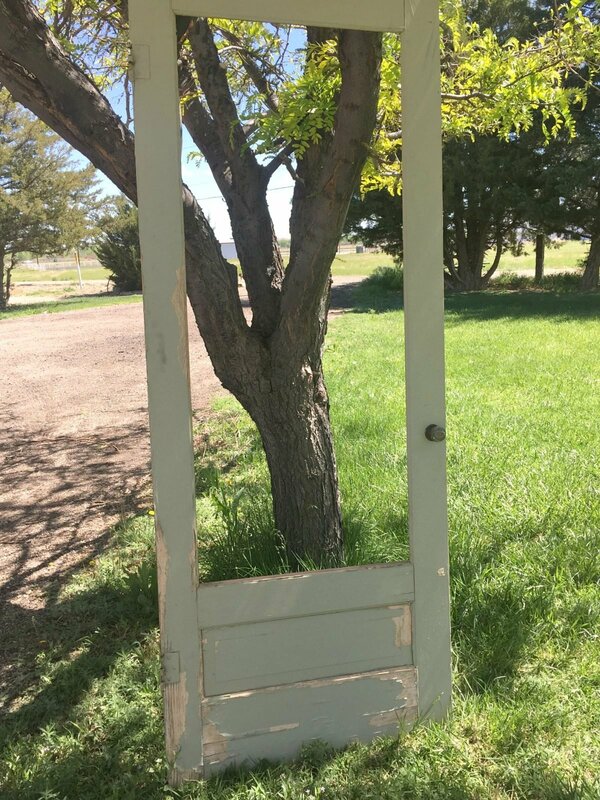 after my mom passed away in 2013 and we were getting ready to put the house on the market, the realtor suggested we remove the “god awful pea green” door from the side of the house. i was more than happy to take it with me and i hung it on the wall leading down to our basement. i remember my mother going in and out of that door with her clothes basket every day in the summer so it is a cherished memory for me. i love you idea for your door and will be pinning it in the hopes another door will come my way. thanks! Oh what a sweet story Kathie! I’m so glad you saved that special door and now have it in your home. What a gift! Thanks for stopping by my friend! I have a door similar to this one and would like to do the same thing. Did you find the mirror at a scrap yard or did you buy a mirror and your dad cut it to size ?? He had a mirror that he cut down to size. But you can go into any local glass company and ask them to do it for you! What did he seal it in with? And what did he put on the back as a protective layer? Thanks! Hi Alex! 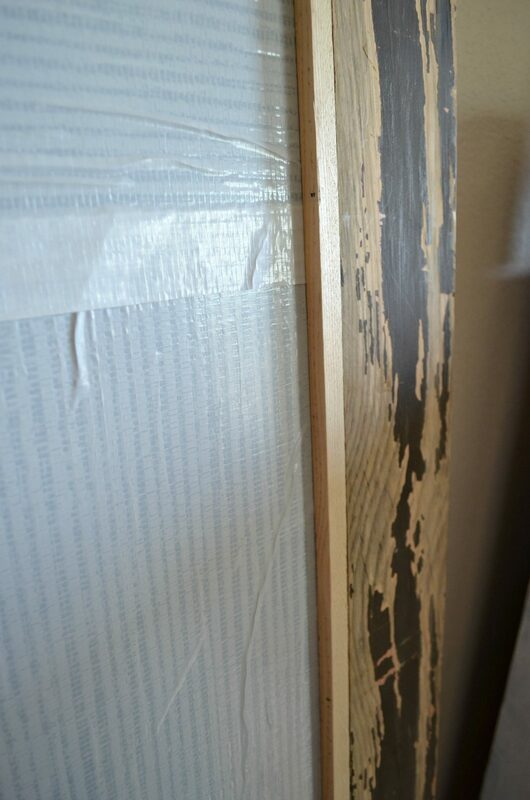 The back of the mirror has what’s called safety backing, any glass company can put it on for you. But you can also just use a heavy duty duck tape as well. It’s basically just a safety precaution in case the mirror breaks. He didn’t seal it in with anything, just used the little pieces of molding. Nail them in and it will secure the mirror in place. 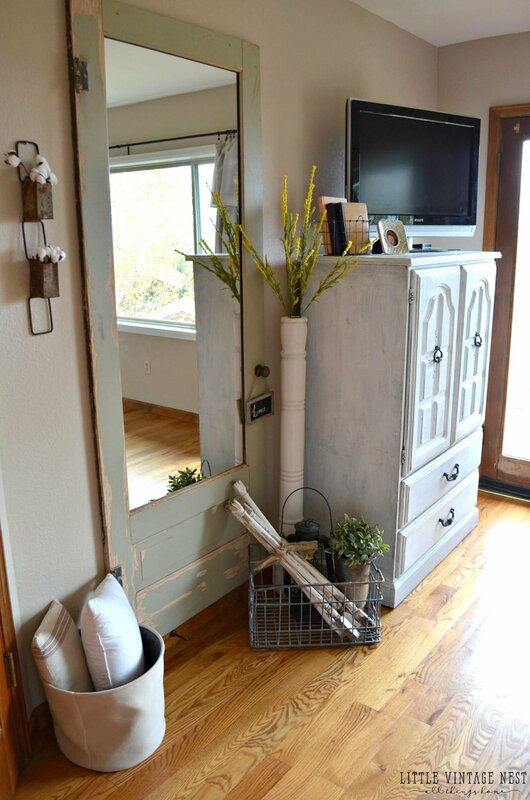 Love the door and definitely your decorating style. 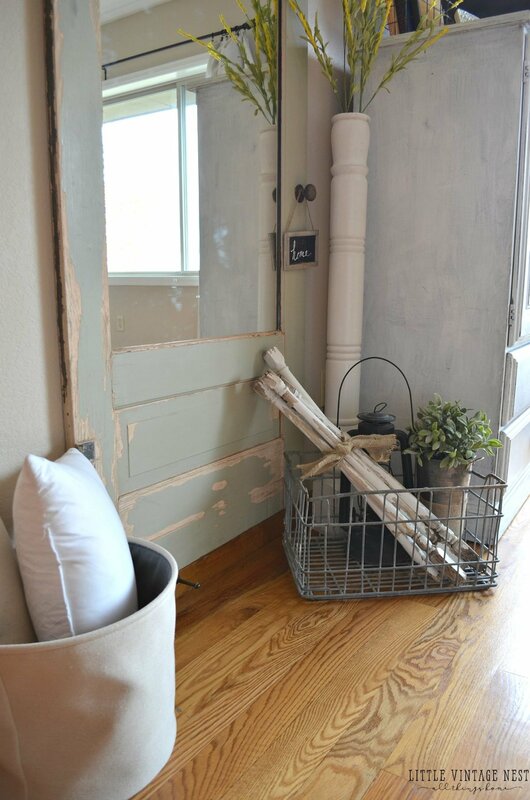 I’m just beginning the process of changing over to farm house style and love all the inspiration your blog provides. I noticed in this post, your bedroom has stained wood trim. My house has stained trim as well and I’ve wanted to add white planked accent walls but was afraid how it would look without going through and painting the trim as well. I’m glad to have a visual and see that it will most definitely work. ???? I think it will work for sure. And you can always go back and paint the trim later if you don’t like it. Good luck Shelley and thanks for stopping by! My daughter has been talking about a mirrored farm door and now I know why. Gorgeous! 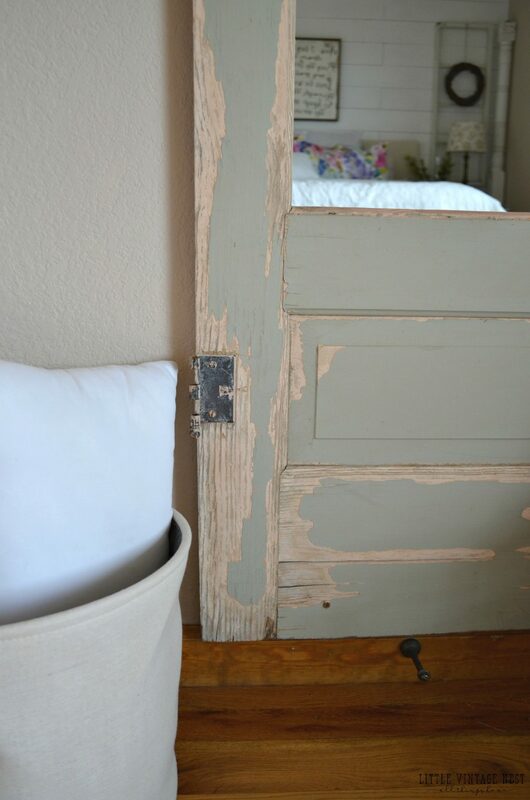 Any suggestions on where to find an old door?